Good thing he’s cute, because he’d pulled up my baby mesclun greens and just-barely-big-enough French breakfast radishes! 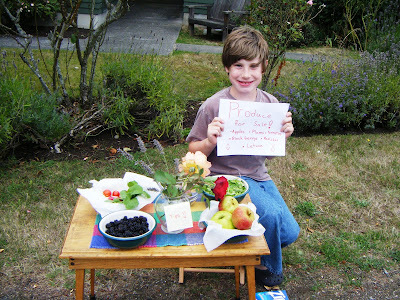 I didn’t have the heart to tell him the apples and plums were hard as rocks, but my neighbor Yvonne just stopped by and bought a bunch of P-R-O-D-U-C-E, leaving a nice “tip” for junior. She owes me: I once bought a couple of actual rocks from her son’s lonesome “roadside stand” — back when the high school senior was in kindergarten.